In the previous blog post I wrote about some of the pros and cons of a ‘buy local’ approach to economic development. ‘Buy local’ is all about the community getting the most out of the money circulating around it. Can more money circulating help insulate a local economy from what economists like to call ‘economic shocks’? In this post I’ll look at one way of assessing vulnerability to these shocks. Most regional economies have one or two industries that bring money into the community. These are usually agriculture, tourism, mining or manufacturing. Service sector industries are also good at bringing money in – either through the sale of professional or technical services to customers outside the region, or through the services they provide to low income people who draw a pension or benefit. But the high value service (tertiary) industries are found mostly in the cities, and while they do provide a good range of employment in regional economies, they play a smaller role than the primary and secondary industries (agriculture, forestry, fishing, mining and manufacturing). The primary and secondary industries are quite exposed to external shocks like drought, flood, price drops and changes in the value of the Australian dollar. In 2005 colleagues and I investigated the impact of the drought on non-farm businesses in two small towns, in an effort to better understand how the effect of an economic shock might work its way through a small economy. 2. Extent of ‘essentialness’ in goods or services sold. Interestingly, we also found that the impact also depends to some extent on the determination and creativity of the business owner. The Figure below presents the model graphically. 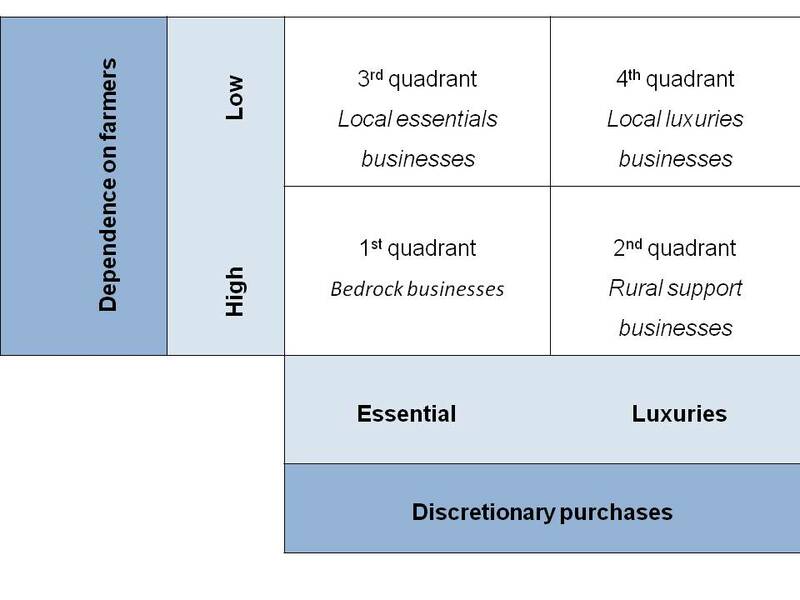 Our interpretation from the interviews was that the most intense drought impacts were felt by the rural support businesses in the 2nd quadrant – small businesses that are highly dependent on farmers but that also sell goods and services that can be “done without” when money is tight. This interpretation is based on consistent feedback that the ‘inner circle’ – the ‘bedrock businesses’ – see a drop in turnover in drought but manage to maintain some (lower) level of sales. The distinctive feature of this group is that sales of some product lines continue even when production and harvesting levels are low. For example, some items of heavy machinery are still turned over, and some farmers typically take the risk and invest in preparing soil and planting crops in the hope that conditions will improve and they will get a harvest. It seems there is a suite of products and services that farmers and non-farmers buy (to some degree) whatever their circumstances, and that these purchases buffer the direct drought impact on the bedrock businesses. Quadrant 3 businesses also reported lower turnover, but were maintaining the lower level of activity despite the persistence of the drought in 2005. The Exceptional Circumstances payments went some way to topping up the spending from farming households, and households with workers in other industries were not seeing such significant income drops. Quadrant 4 businesses were an interesting mix, with most scaling back but one or two taking a risk and transforming their businesses to maximise profitability in a period of reduced demand, or at least of changed demand. The jeweller in one town, for example, had changed their stock mix and introduced some new payment models to reflect a pattern they’d noticed for less frequent but occasionally more expensive purchases. 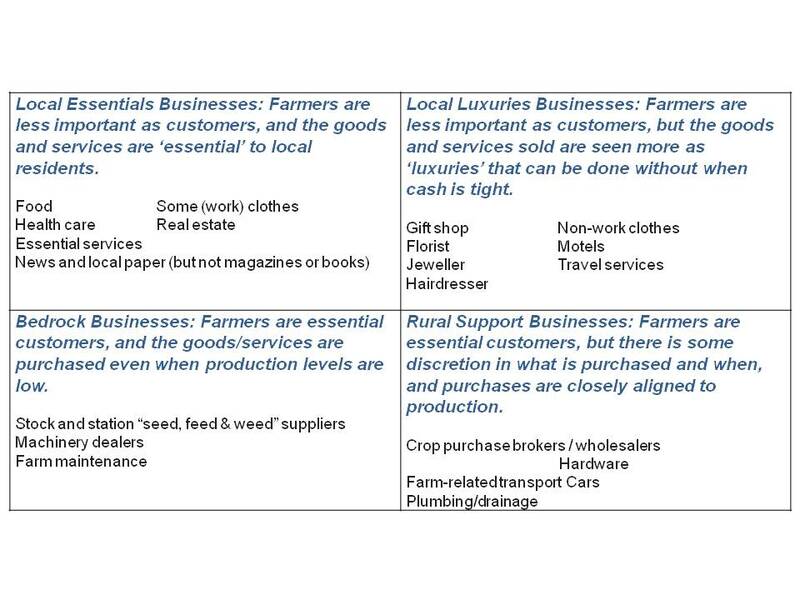 When we did this work we felt that the simple model reflected the reality of non-farm businesses in the towns. While the feeling around the towns, and the conversations on the street, were that “the drought is killing the town”, in fact the businesses really struggling were limited to those most reliant on farm activity. And with activity falling away there was much less demand for services to do with planting, cropping, grading or distribution. We also noted that the Exceptional Circumstances payments available to farmers in those areas, while not large amounts of money, in fact did add to a fair proportion of what might be an ‘average’ farm household income – thereby further dampening the immediate impact of the lack of farm level activity. While the drought has passed, the high Australian dollar has been the latest economic ‘shock’ to have a serious impact on regional farming, fishing, timber and manufacturing businesses. It is highly likely that the next challenges will be a gradual fall in mining-related construction activity – which will take the heat out of those regional communities running strongly in mining and mining services. A fall in the value of the Australian dollar should help other exporters – and may even bring back some of the domestic tourists who have recently been holidaying overseas. We are currently working with the community in Scottsdale in northeast Tasmania on their transition caused by the loss of hundreds of jobs in logging and timber processing. So the pattern of external shocks is bound to continue, and a question for another blog is whether or not survival is the goal, whether resilience and bouncing back is what regional economies should be aiming at, or whether transformation is in fact inevitable – transformation into a local economy that has less to do with the strengths of the past and more to do with the opportunities of an uncertain future. With many changes of Departmental nomenclature since the work was done, the website that held a link to the Drought Impacts Beyond the Farm Gate study is long gone. I’ve attached a copy to this post. This entry was posted in Economic development and tagged drought, Economic development, flow on effects, multpliers, small business on August 20, 2013 by kimhoughton.